Welcome to Fedora Weekly News Issue 281 for the week ending July 13, 2011. What follows are some highlights from this issue. In announcements this week, details on the upcoming FUDCon APAC 2011 and call for bids for FUDCon LATAM and FUDCon APAC 2012, as well as systems outage notification. In development-related announcements, details on the feature freeze for Fedora 16. In Fedora In the News this week, we have several more international contributions, including pointers to several PCWorld Albanian articles on Fedora, a Brazilian Portuguese interview with FAMSCo member Igor Pires Soares, a LATAM Fedora magazine, and much more! In Fedora Ambassadors this week, notice of new Ambassador team members from all over the globe as well as coverage of the Ambassadors and FAMSCo discussion lists. In QA news this week, details and updates on release criteria and validation testing, and AutoQA work. Security Advisories provides a list of security-related packages released July 6-13 for Fedora 14 and 15. This issue wraps up with coverage of the Fedora Planet, including pointers to announced events and general Fedora Project-relating postings! "It's my pleasure to announce that the winning bid for FUDCon in the Asia-Pacific region for 2011 is Pune, India. FUDCon APAC 2011 is scheduled for November 4th through 6th at the College of Engineering, Pune, India. FUDCon is the Fedora Users and Developers Conference, a premier Fedora event that is held several times a year in different regions of the world. For more information on premier Fedora events, see the Fedora wiki. As you might imagine, choosing the winning bid was a difficult decision to make, as both bidding teams have put together very compelling bids. I'd like to publicly thank both teams for their hard work and effort, and invite the Beijing team to submit a bid for next year's FUDCon APAC as well. I'm also now opening up bidding for FUDCon APAC 2012 and FUDCon LATAM 2012. FUDCon APAC 2012 will be held between March 1st and May 31st, and FUDCon LATAM will be held between June 1st - August 31st. All bids for both of these FUDCon events should be submitted by August 11th. If you have any questions or concerns regarding FUDCon events, I invite you to subscribe to the FUDCon planning mailing list. We will be removing old systems and putting in new ones at the Red Hat colocation facility in Phoenix. No other outages are planned, but deracking of old machines and racking new ones could result in outages or instability in existing services. And finally.... for those of you interested in seeing how the Feature List is shaping up for Fedora 16, it is up to date with the latest and greatest approvals from today's FESCo meeting. This is where I'm going to put on my Gentle Reminder Hat, and give everyone a chance to go into their individual feature pages and update their percentage complete, and update their "Last Updated" date, which I will apply to the main FeatureList page. Your efforts here are appreciated, and help a number of groups understand how close you are to completion, or conversely, if you are at risk of not making deadlines. If percentages don't start getting updated, and "last-updated" dates aren't getting touched, I'll be reaching out to folks individually, but I would prefer to see that people take the initiative and keep those things up. Otherwise I have to get out the not-so-Gentle-Reminder-Hat, and frankly, I don't look very good in that one. Communication is the key here. If you believe you are *at risk* of not making the Feature Freeze, please update your feature page accordingly. PCWorld Albanian is a famous Albanian magazine published monthly and they also have their blog online, some of the articles were also printed on the magazine and they always gave a big support for our activities in Kosovo. Thanks, -- Gent Thaçi, https://fedoraproject.org/wiki/User:Gent gentt on irc.freenode.net at #fedora-ambassadors"
"Xen made virtualisation a popular issue on Linux servers and seemed for a long time to be the open source virtualisation technology of choice. But the Xen developers lost that advantage by setting the wrong priorities. KVM was able to take over some key positions and, with a large number of promoters, is now in a better position." "Overall I think Fedora 15 KDE is a very attractive desktop distro. It comes with a good selection of software and an attractive & highly usable version of KDE. There’s not a lot here to complain about and there’s quite a bit to be happy about. I suspect that Fedora 15 KDE will be one of the distros that wins over wavering GNOME & Unity users. Fedora 15 KDE is suitable for beginner, intermediate or advanced Linux users." "Fedora has long been touted as being one of the most professional, stable, cutting-edge distros out there, and seeing as though its latest version brings GNOME 3 along for the ride, I couldn't help but download and install it. I've since used Fedora 15 for an entire month, so read on as I take a look at this release from all angles." "Some folks might be unaware though that Fedora comes in a number of different versions; each designed to appeal to a particular audience. Yes, it’s true. Fedora has many faces and here’s a brief look at each of them for those who might be interested in taking another look at this fine desktop distribution." I had a chance to interview Igor Pires Soares from the Fedora Project and chat about how he got started with translations, participating on several organizing committees and his travels around the world! He talks about getting lost in Chile, learning English and Spanish, the role his university played on his career, his top 5 books, movies and his interest in music, including a very special moment during a U2 show in São Paulo. The interview is in Brazilian Portuguese, but anyone who can speak Portuguese or Spanish should be able to enjoy it!" "After looking around for a good introduction video to GNOME 3 I found this one. It is the best one I've found so far. Unfortunately it seems to only be available in Flash format. Since Fedora 15 was one of the first distros to ship GNOME 3, it also covers Fedora some. Enjoy." "Fedora 15 - 32 y 64 bits Fedora 15 -"Lovelock" es lo último de la comunidad GNU/Linux apadrinada por Red Hat. Esta nueva versión viene con muchas y muy interesantes novedades. Por un lado implementa la nueva versión del escritorio Gnome -Gnome3 -con su revolucionario Gnome Shell, un nuevo concepto de escritorio. Para navegar por Internet tenemos Firefox 4, el navegador de altas prestaciones de código abierto; y para productividad ofimática, la suite LibreOffice, el fork de OpenOffice avalado por la Open Document Foundation. Aparte de Gnome, en el DVD podrás elegir instalar otros escritorios, tales como KDE 4.6, lo más moderno de este excelente escritorio; también se incluyen XFCE y LXDE, dos escritorios ligeros, pero extremadamente potentes y con multitud de funcionalidades. En la cara B encontrarás la versión de 64 bits, la más apropiada para portátiles de gama media y alta, y ordenadores de escritorio modernos"
This section covers the news surrounding the Fedora Ambassadors Project For the period 05 July 2011 to 13 July 2011. Each and everyone of us in Fedora Community is happy to have you as part of our Ambassadors team. We wish you very best in your endeavors. Congrats and Wishes to all New members from Fedora Team. Thanks Joerg (kital) Simon for inviting them with welcome message. John(Fid : inode) shared his view on fedora stickers, he suggested that discounts may be availed if larger quantity order is placed. Take a look at 2.5 " sticker, mail him if you like to join John for the order. This is larger logo is laptop sticker, planned for the order. Smaller ones are called case badges. John is planning for 20K order, so it will be 5k per region. For EMEA and APAC, plan is to ship it with people to FUDCon to reduce expenses. - kaio expressed his view on postage and manufacturer discount order quantity for stickers Gerard (gbraad ) suggested local production of stickers for APAC,china as it may reduce shipping cost and production cost. 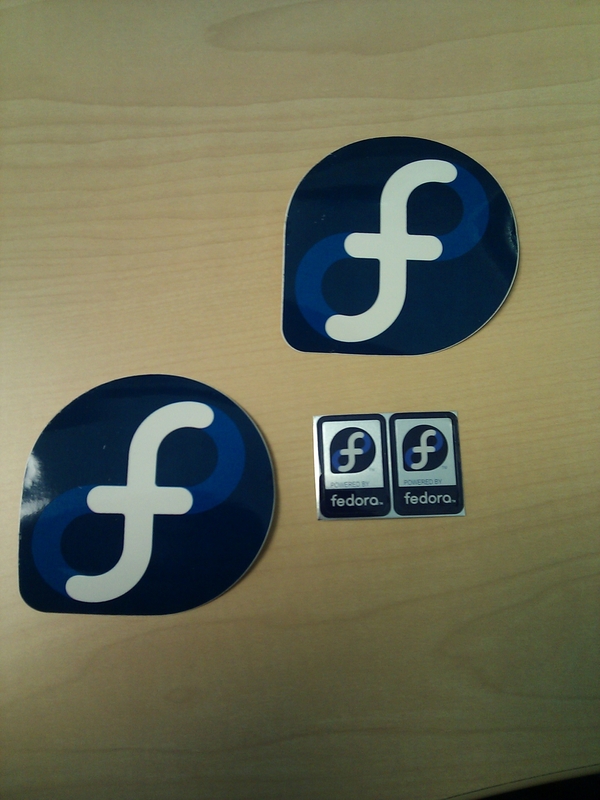 David Ramsey greeted all Fedora members, and asked the APAC members if they are interested in 3" stickers Suresh from srilanka thanked Tom and Darmsey for stickers he received. He would like to request a quantity order of around 200 for srilanka. He likes the idea of local printing of stickers at srilanka. Manuel Escudero enquired how he can place an order for stickers kaio explained that Manuel may request in mailing list . He also proposed a Fedora-store for public. John(inode) explained briefly on the sticker price and quantity. He said that It appeared that from our initial quote 5000 of these would cost NA around $1,000 but the marginal cost of adding an additional 5000 might be as low as $300. Given that low marginal cost he thinks that we should seriously consider a much larger order so we are requesting quotes for 12000, 16000, and 20000 now and expect to have those quotes in hand within a week. NA won't be making any decision on this until we see those quotes and we'll share the costs with others who might want to join with us before we order. So he asked everyone stayed tuned for about a week and to see what the final numbers are for larger orders. Maria Gracia Leandro (tatica) wrote that LATAM may need atleast 1000 and planning for atlas 2 countries to plan for distribution. mark shared his view with everyone that he finds that stickers to be a happy seedling for fedora community. Pierros requested to file the appropriate trac ticket on famsco, if needed. He suggested 20000 in quantity. Neville wrote that community members may better be plan the events ahead along with sticker delivery. John wrote his view that 20000 may be the right quantity and it may be split among regions as required. kaio is waiting for stickers, kaio wrote this to community. jsimon on 11 July wrote to community that 150KG of media arrived ie 5000 pieces,ready for distribution. Special thanks to Christoph Wickert as Media Wrangler,Appreciated. Jsimon will be taking up shipping. Boxes will be for a minimum quantity of 110 media per box. Please avoid single media request. Log: http://meetbot.fedoraproject.org/fedora-meeting/2011-07-06/famna.2011-07-06-01.00.log.html beats editor appreciates attitude of sharing positive sprit, also would like to point to all those positive spirited members that email traffic reduction on network is good practice. Neville wrote to community on 7th July about meeting planned on 9th July at 14 hrs UTC Igor Pires Soares shared meeting details FAmSCo held a public meeting and took a time to discuss aspects and approaches for next FADs and FUDCons. We had a great two days event in Paris the 4th and 5th of June. I know that it happened a month ago, apologies for this late report. In the talk room we were discussing about new F15 features, and then there was a 2h BoxGrinder workshop. In a workshop room we worked on sound composition using FOSS and then there were discussions about LaTeX. The install party in itself was in the master room (about 100 people there with 20 FOSS contributors). We spoke a lot about GNOME 3, and we made lots of live USB. In this room, there was a big white screen in which I displayed a slideshow about the event planning, the first page of our newly released Muffin 3 magazine, a summary of "How to contribute" and websites. For this "slideshow" I used the GNOME Shell power: I wrote a plugin to auto switch between workspace. No need anymore to write something in LibreOffice. One full screen window in each workspace and you're done! KDE lovers were silent. This is what we usually do for each release. But this time we wanted more, this is why we planned this second contribution day! We where about 10 French Fedora Project contributors here to work on different subjects and showing people to know how to be involved in the Fedora Project. We encounter some French forum users. That was nice, we spoke a lot. Firstly we wanted to improve the LXC template but there was a new release only few days before, and we didn't really had big project on which we would be able to work. Every contributors have their wide TODO list. Next time, we should define some projects and start before the targeted day, in a FAD way. Rui He added the finished VNC installation test cases to the install testing template. Adam Williamson provided a survey comparing the Beta release criteria against the validation test cases, as he previously had for the Alpha release criteria (see FWN #280), and began filing tickets to request updates to the validation tests where needed. James Laska put into production his proposed changes to the release criteria to make them more generic (see FWN #280). James proceeded on to considering ways to implement release criteria and criteria variations specific to secondary architectures, outlining several possible ways to proceed with this. Jóhann Guðmundsson, Adam Williamson and Dennis Gilmore provided feedback on his proposals, and all involved generally agreed on an approach to the problem. Adam Williamson expanded his proposed 'base' release validation test matrix into a full proposed template page, and requested feedback on the draft. Michael Schwendt reminded proventesters not to file positive feedback on an update for which a previous tester had provided negative feedback unless they were very sure the negative feedback was erroneous. Having finished and released AutoQA 0.5.0, the AutoQA team was planning for the 0.6.0 development cycle. James Laska and Kamil Paral have been working on an SOP for AutoQA releases. Praveen Kumar gave an overview of the upcoming FUDCon India event, and information about attending or getting involved in preparations. Amit Shah wrote a planning/responsibility list for FUDCon India, which breaks down who is working on what and further preparations that need to be made. Suchakra Sharma posted some preliminary logo designs for FUDCon India, as well as some promotional artwork. Ben Williams issued a general request for those willing to hold workshop type sessions, barcamps, or hackfests, stating that he is doing "A lot of brainstorming to make this the best FUDCon ever." He also announced that the hotel for the event will be the Inn at Virginia Tech. Mohammed Morsi will be presenting a keynote on Aeolus, an open source cloud management framework next week at FOSSCON. He will be discussing details of the framework and how it integrates with cloud services. Rahul Sundaram detailed the work being done to integrate askbot into Fedora in an article entitled 'The case for Ask Fedora'. He hopes to turn it into a Q & A oriented community to support Fedora users. Jeff Darcy blogged on the features of CloudFS and how it will work with the upcoming Fedora 16. The Pulp team has announced the arrival of Pulp release 14, which brings numerous enhancements. Rares Aioanei has published the latest edition of the kernel weekly news, detailing the most recent work being done on the linux kernel. This page was last edited on 18 July 2011, at 18:35.